My garden railway does not have the room for a decent sized engine shed area, so I decided to build a portable diorama that could be used for storing locos during running sessions. It was also a good indoor project with the approach of Winter. The track would not be powered, basically this was little more than a posh shelf. First job was to build 2 baseboards (with backscenes), each 2 foot by 2 foot 6 inches which would join together to make a 2 foot by 5 foot diorama. For transporting one of the baseboards is inverted and fits on top of the other forming a box. This box fits in the back of my hatchback car. When set up the baseboards are joined using these over-centre catches. The baseboards were painted a neutral brown colour and the backscenes painted using acrylic water colours. The tree is a Schleich model. As the track was not going to be powered, I used this rather old design of pressed stainless rails which slide into real wooden sleepers, given to me by a friend. The finished track was glued into place. 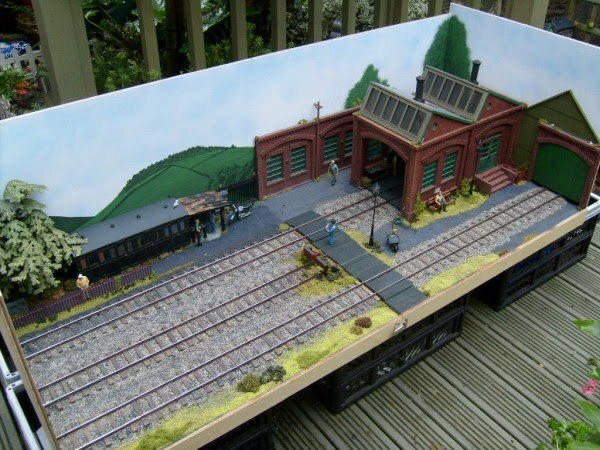 I used "Brush It On" O gauge ballast available from Modellers Mecca at Wall Heath. I think the track looks great when painted and ballasted. It could do with some cosmetic spikes or chairs .......... a job for when I'm REALLY bored!! An overall view of the finished diorama. 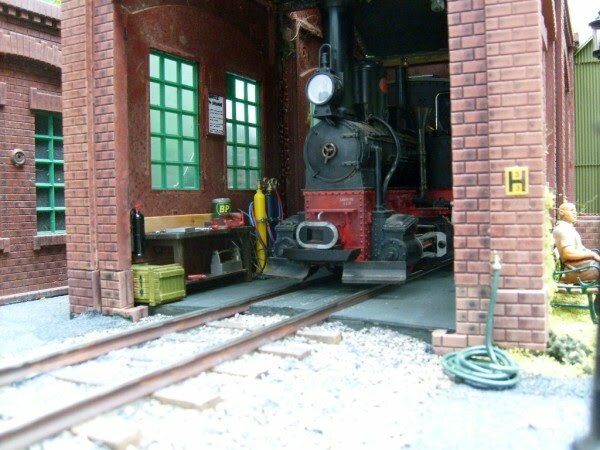 The engine shed is a Pola kit. The grounded coach body is an IP Engineering kit. Note the sleeper crossing (built from stripwood) which disguises the baseboard joint. Finally, some views of the diorama with some rolling stock in place. Stainz locomotive in the engine shed, with the workbench clearly visible. The permanent way dept. have the use of the short siding which only covers one baseboard. The buffer stop is made from stripwood. 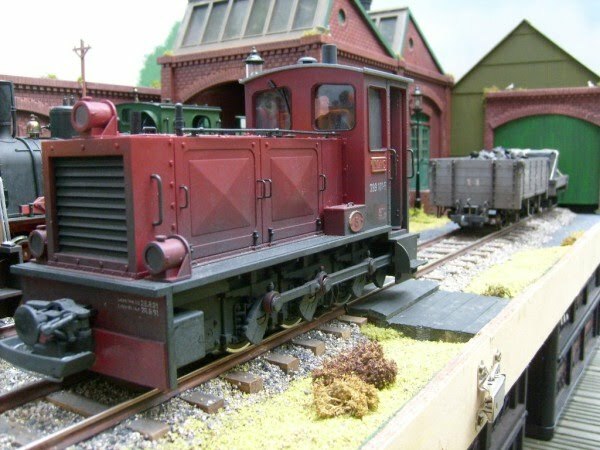 Ground cover is from the excellent Woodland Scenics range. 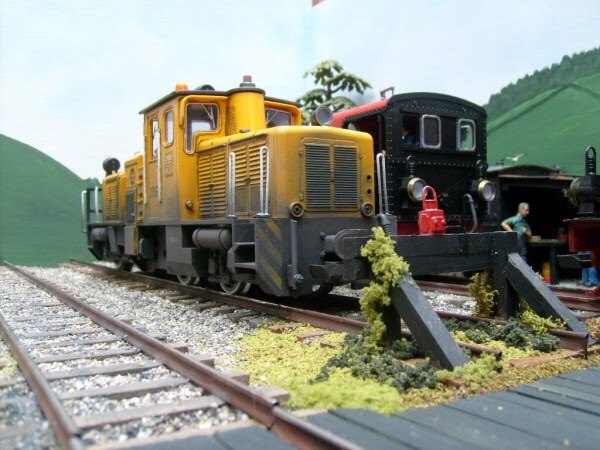 The diesel shunter sorts stock for the coach and wagon workshops.